The synthesis and transport of biological lipids across the mostly water-filled interior of the cell is a longstanding problem in biology. One of the solutions that nature has employed to solved it, is to use lipid-binding proteins, which work in various ways: enzymes that penetrate biological membranes, “chaperone” proteins that solubilize lipids in a pocket and transport them to enzymes or insert them into membranes, and “liftases” – enzymes that partially lift the lipid from the membrane bilayer. One of the most important lipids is coenzyme Q (CoQ), which serves as a cofactor for numerous enzymes in many different organisms. Deficiencies in CoQ are linked to rare metabolic problems and to diseases like Parkinson’s and type II diabetes. 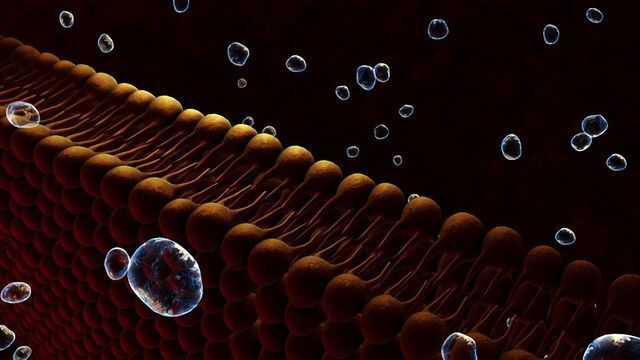 CoQ is also one of the most hydrophobic (“water-hating”) molecules in nature, lying sequestered deep inside the mitochondrial membrane and involved in its energy-producing work. A poorly characterized protein associated with CoQ biosynthesis is a lipid-binding protein called COQ9. This protein seems to be of critical importance in this pathway because loss of COQ9 function in many organisms results in severe CoQ deficiency – with all the problems mentioned above. Nonetheless, we still do not know which lipid(s) COQ9 binds, or how it accesses them, or even how binding them help other enzymes in making CoQ. Scientists from the lab of Matteo Dal Peraro at EPFL’s Institute of Bioengineering, working with the lab of David Pagliarini at the University of Wisconsin-Madison, used an integrative approach that combined structural, biochemical, and computational studies to study how COQ9 binds and interacts with lipids. Their research results have been published in Molecular Cell. The study showed that COQ9 binds aromatic isoprene lipids and accesses membranes through an amphipathic (both water-loving and -hating) helix at its end. Both of these functions seem to be crucial to the protein’s biological role in the production of CoQ. The scientists also found how COQ9 might interface with an enzyme of the pathway, COQ7, which catalyzes the next-to-last step in CoQ biosynthesis. The data from the study show that COQ9 enables the biosynthesis of CoQ by accessing CoQ intermediates from the leaflet of the mitochondrion’s inner membrane. From there, COQ9 presents these intermediates to a biosynthetic enzyme. In addition, the integrative approach used by the scientists could serve as a model for studying other lipid binding proteins or lipid metabolism or signaling pathways whose fine functional modulation at the membrane-water interface has been historically challenging to characterize. Reference: Lohman et al. 2019. An Isoprene Lipid-Binding Protein Promotes Eukaryotic Coenzyme Q Biosynthesis. Molecular Cell. DOI: 10.1016/j.molcel.2018.11.033. Biology is such a fascinating subject – breaking down and “understanding” the complexity of the human physiology is awe inspiring. Highly interesting.